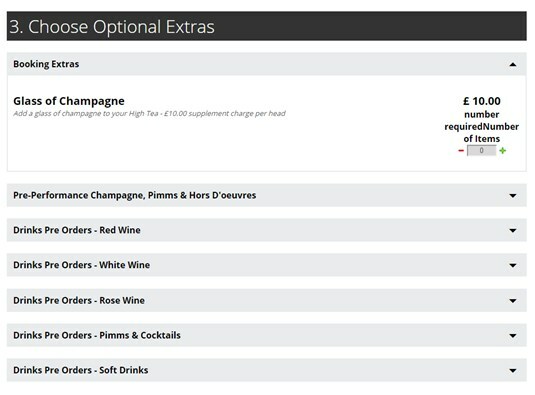 Products come with the option to configure extras/suggested products on the booking page. Additional products can be added as optional extras or "Upsells" to events. Users will not see these Upsells until they reach the availability page of the booking process. Here they will be able to select whether or not to include these products as part of their order. For details see the [[LINK=settings-products-eventupsell|Event Upsells]] and [[LINK=settings-products-physical|Physical Item]] pages for more details on these types of Upsells. Where applicable, select the Upsell Product to be linked. This allows you to display a selection of Products on the Basket Page which might be relevant to the interest of someone making a booking for this product. Note: This option allows you to link any type of Product, except for Event Upsells. Not an Upsell in itself, this creates a Heading which allows you to group your upsells. These headings can collapse to allow a lot of upsells to be shown. 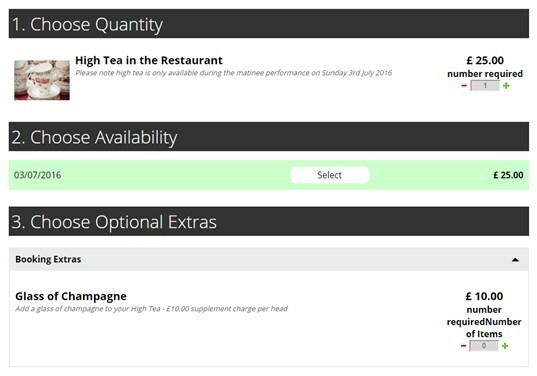 In the screenshot below, headings have been created for "Booking Extras", "Pre-Performance Champagne, Pimms & Hors D"oeuvres" etc . This creates a section hwere the customer must choose one of the provided options before they can continue onwards with their booking. Repeat steps 8 and 9 for any additional security groups that are applicable to this Upsell.